Soy Sauce is one of the most important ingredients in Japanese Cooking. Together with dashi (soup stock), It is the base of many Japanese dishes. Koikuchi Shoyu (濃口醤油 or こいくちしょうゆ）- Dark/Thick Soy Sauce - 80% of the Total Soy Sauce produced in Japan Falls into this category. If your recipe calls for soy sauce, this is the one you should choose. Salt content is approx. 16%. 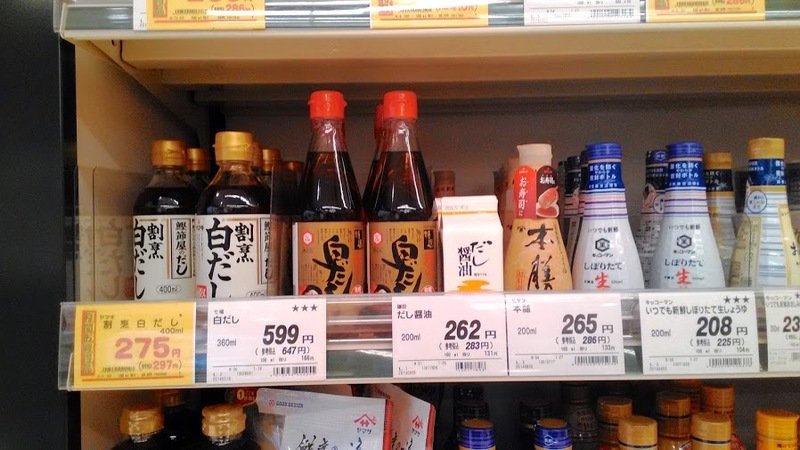 Most soy sauces sold in Tokyo and the Kanto Area fall into this category. Usukuchi Shoyu (薄口醤油 or うすくちしょうゆ）- Light/Thin Soy Sauce - A light colored soy sauce that is used for dishes where you do not want to color it brown. It is used heavily in the west regions such as in Udon soup in Osaka and Kyoto. Despite its color, It actually has about 2% more salt content than Dark Soy Sauce. Tamari Shoyu (たまり醤油）- Extra Thick Soy Sauce - Wheat free soy sauce. It is made only from soy beans and it is thick and rich in flavor. Usually used for teriyaki sauches, basting senbei and such. Saishikomi Shoyu (再仕込み醤油 or さいしこみしょうゆ）- Twice Brewed Soy Sauce.- Very thick and expensive, used mainly as table top seasoning. Usually used as a dipping sauce. Shiro Shoyu (白しょうゆ）- White Soy Sauce - In contrast with Tamari Shoyu, this uses mainly wheat with very little soy beans. It has a rather transparent color and used commonly in the Kansai area for dishes which need to keep its original color. Gen-en Shoyu (減塩醤油 or げんえんしょうゆ）- Reduced Salt Soy Sauce - This soy sauce has 50% less salt content than regular soy sauce. 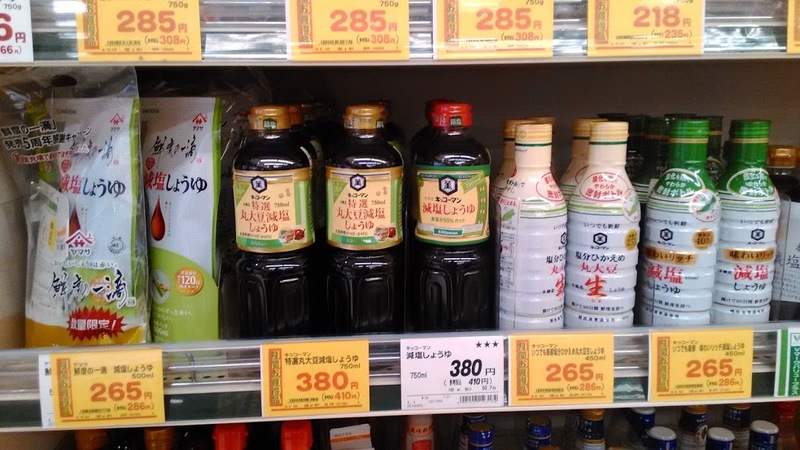 It is used in place of normal soy sauce for people with a special diet. Ki-Shouyu (actually pronounced "Kijoyu") （生醤油or生しょうゆ） - Pure Soy Sauce which is not heated. More fragrant. Kokusan Marudaizu（ 国産丸大豆） - Using domestic whole soy beans instead of compressed soybeans. I personally try to get domestic soy beans as they are not GMO. This a smaller size of the Dark Soy Sauce . The blue cap is the most common type, the gold cap is better quality using whole beans instead of the crushed ones. The one with the orange cap is the Light Soy Sauce（うすくち）- You don't see a wide variety of these in Tokyo as they are more common in the Kansai (West) area. These are the Pre-seasoned Soy Sauce with dashi (soup stock). You can use these to make udon soup just use them instead of soy sauce as they have more flavor. Look for the word "だし”　or "白だし"